Have you ever discovered a place that you just immediately fell in love with, almost even before you entered? That’s how it was at Ban Lue Handicrafts & Homestay, an oasis in a village called Nayang Nua in northern Laos. It’s an inspiring, charming, and creative space. This place came about from the vision of Somedeth. One afternoon he shared his story, the story of his village, and the passion for his project, which is what he likes to call it. The words visionary, entrepreneur, and community mobilizer easily come to mind for Somedeth, but he seems a bit more humble than all that. He’s a guy who was called back to his village by his aging parents to take care of them, so he did because that’s what they do in Laos. Soon after he met Khone, now his wife. He still hadn’t found suitable work in his village, though. After being gone for so long, what’s a 33 year old, well-educated, English-speaking city guy to do in a rice-farming village still making traditional handicrafts for their own livelihood? Dream big (and see the Lao version of a dreamcatcher above his head, made by Tai Lue families of bamboo and cotton thread, and given to temples to make dreams and wishes come true). 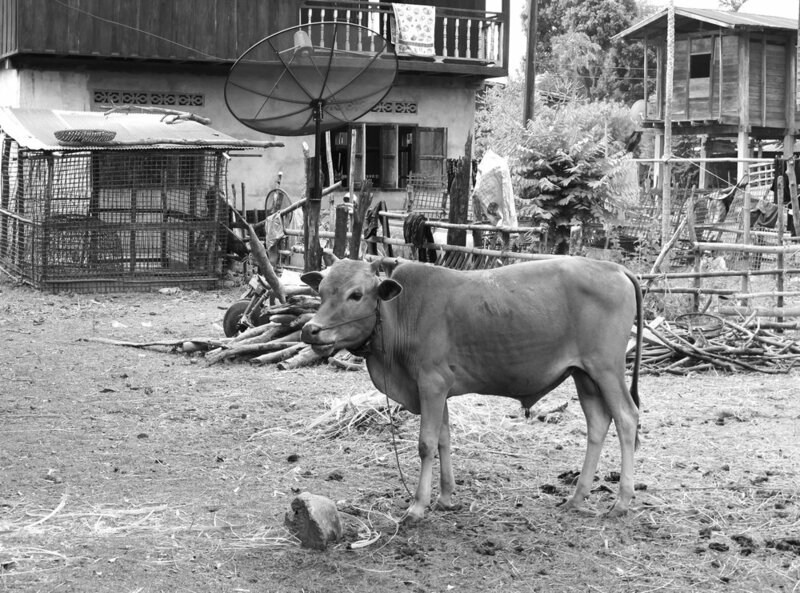 Growing up in Nayang Nua there was no electricity, no running water, no market, and no bus connecting them to any other place. He and other children had to walk far to go to school. At age eleven he was sent to the capital city, Vientiane, to become a novice monk at a temple and get a better education. This is still common practice in Laos, as education at temples is better than in public schools. There he studied English and did well in school. But he wasn’t able to visit his parents at all during that time. The roads were terrible and with no busses, and it was a very hard journey. There were also no phones, so he could only communicate with his parents by letters. Afterward, he went on to college and studied Business English, working many part-time jobs in between at big hotels, the airlines, and government. Nayang Nua today – 180 families enjoy electricity, better roads, satellite dishes, scooters, smartphones, a weekly market, and running water into homes. Nong Khiaw is a beautiful tourist destination only thirty minutes from Nayang Nua. Somedeth connected with a friend there to be a tour guide. He liked it, was good at it, and liked interacting with foreigners. One time a couple asked him if they could visit his village as a tour, and therein sparked the idea that Nayang Nua has something to offer of interest. 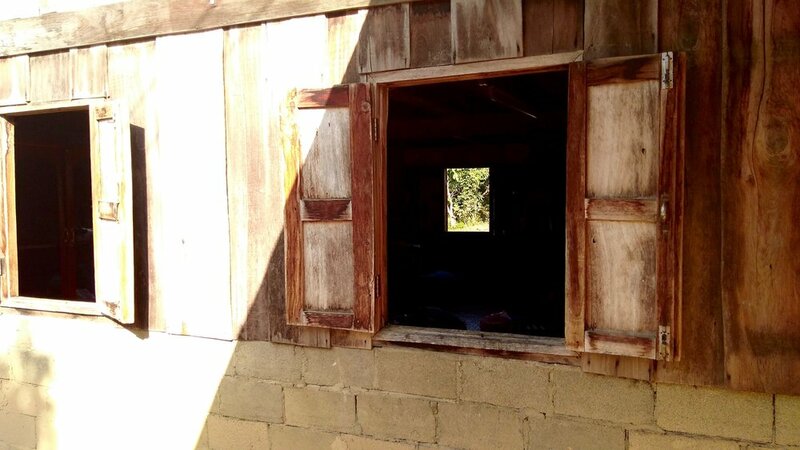 His wife’s parents wanted to build a new home in the village made of concrete (a growing trend) and were going to tear down their old wooden home. Somedeth begged that they not tear it down, than in fact he had an idea to create a handicrafts and homestay there, and could this be the place. He needed the other villagers on board to create this vision of revitalizing traditional crafts and community development. Anyone could share their skills, could help cook meals for guests, could sell their handicrafts to tourists, and be a part of this initiative, he proposed. They could earn additional income. Many villagers thought he was crazy. Others didn’t believe him. But a few did, and helped out, and helped rebuild the place for a handicrafts center and homestay. It opened last spring and it’s been wonderfully successful since. Bokai, one of the master weavers, at a loom in the open learning space under the main house. For two days I and my two traveling companions (Susan McCauley of Mekong River Textiles and her friend Nayanee) tried our hands at new things – like taking the seeds out of cotton, then fluffing it and spinning it into thread, and making a bamboo tea strainer. It wasn’t easy, but it was great fun. Left to right: Phon taking seeds out of the raw cotton; Sang spinning cotton into thread; Bokai weaving natural and indigo-dyed thread into a scarf. Left to right: Sang pulling mango leaves from a tree at the handicrafts center; then the mango leaves are boiled for a couple hours, creating a wonderful sweet yellow for dyeing woven cotton. Left to right: A Japanese guest; master bamboo artisan and Somedeth’s father-in-law; Nayanee, Susan, Phon, Sang, me, Khone, and Somedeth. 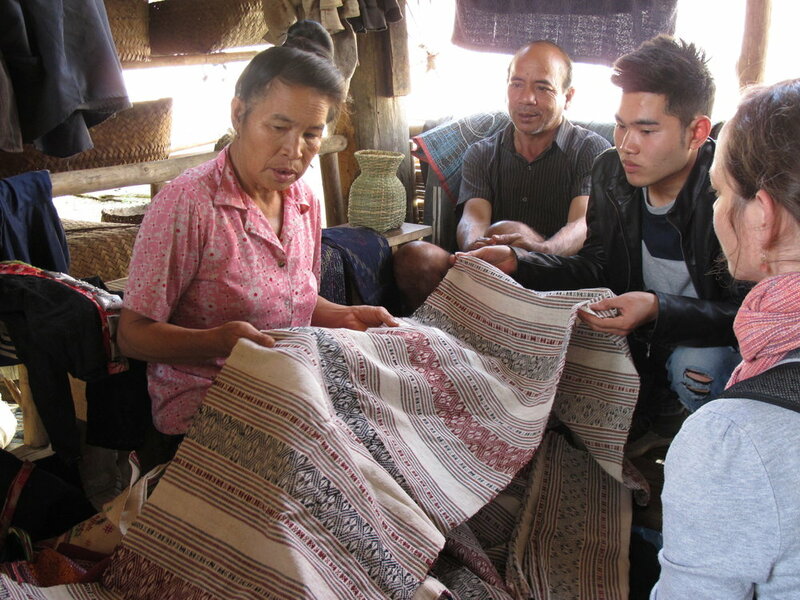 There is so much to say – about the experience of learning from the weavers, of experiencing traditional crafts directly, and coming away with deep respect and appreciation for the village of Nayang Nua, its life and especially its people. In a forthcoming blog I will share more of this, so stay tuned! I was asked not that long ago, “Why Laos?” I didn’t quite know, but did feel that Laos was calling me. So I set about to find out more on my most recent trip there in February, a place that continues to let me discover it. Laos’ aesthetic is inviting, intriguing, and alive. From its Buddhist temple art, its living cultures among many distinct ethnic groups, and range of traditional designs in textiles, it’s calling me for deeper exploration and learning. Laos' aesthetic is also inviting in its urban spaces, its rural landscapes, its daily life. With an artist's eye I notice details, textures, and compositions. This is what I've captured in the images here. I am no expert, nor a historian, anthropologist, or curator. But as an artist and social entrepreneur, my curiosity opens up to discover the people and story connected with the aesthetic that draws me in. I try to do this especially with the textiles traditions and weavers. And sometimes, often times, I don't know 'the story' of what is or why. These image are like that. Wordless stories emerging out of respectful seeing that open up to being okay to reside in not knowing. 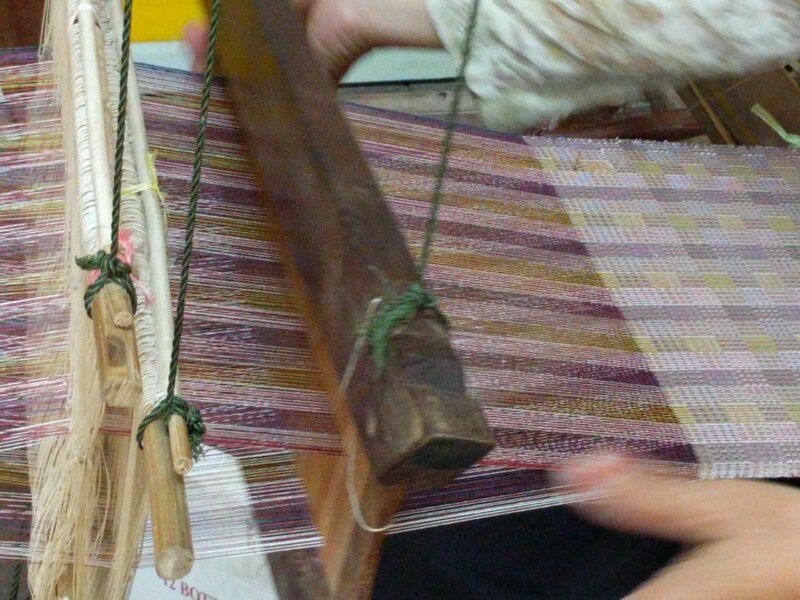 In returning to Laos, I wanted to learn more about the various traditional weaving techniques and how indigenous plants make such natural colors for dyeing textiles. I discovered this and more, at a lively, tucked-away place on the outskirts of Vientiane. Upon arrival to Houey Hong Vocational Training Center, I had the pleasure of meeting Sengmany Vongsipasom, who manages the day-to day operations of the center. She is a delightful, attentive, and lighthearted person, who translated a great deal for me while I took a two-day natural color dyeing course. She had spent many years in the US, until returning to Laos about seven years ago to take care of her aging parents and oversee the center in which her sister started. Sengmany’s sister, Chanthasone Inthavong, started the center in 1998 with the support of two Japanese non-governmental organizations to focus on providing training to women in three main areas: sewing and tailoring, natural dyes, and weaving; along with support in small business skills and development. At its core, Houey Hong Vocational Training Center endeavors to revive and strengthen Lao’s weaving and natural dyeing traditions. The staff of weavers, dyers, artisans, tailors, and designers are expert in their fields, who continue to not only train others but create a wide range of handmade textile accessories, home accents, and fabric for international and domestic clients. Houey Hong has 28 people on their team now, including two gardeners, a driver, workshop trainers for foreign visitors, and a super star Japanese volunteer, Hiroko. She has been there for four years and assists in many aspects of the center, including coming up with new product designs. There is also a daily rotation of foreigners coming to Houey Hong for workshops to spend a half day, a day, or a few days like myself trying one’s hand at shibori dyeing a silk scarf, or weaving a supplemental design sample, or learning the natural color dye process. I signed up for all of them, of course. In the video above go behind the scenes with Yo and Nyai, natural dyeing experts and patient teachers in showing the alchemy involved in transforming jackfruit wood, marigold, indigo, and stick lac to make delightful yellows, blues, and reds. Then Bibi and Hammy show how to dye silk scarves in shibori designs. In the video above, the magical finger work of the supplemental weft weave comes alive from one of the expert weavers. I also had a chance to learn it, with a much simpler design and slower pace, from Bibi, below. Hammy, left, who showed how to prepare a silk scarf for a shibori design natural dyeing and Bibi, right, who helped with dyeing textiles and showed how to do supplemental weft weave. They have been able to keep their focus on traditional designs in weaving, use of indigenous cotton and high-quality regional silk, and exclusive use of natural color dyes. At the same time, they are innovating on their ‘ready-made’ textile accessories and home accent products for wider markets. They have trained 714 people in weaving and natural dyeing processes, and 192 in sewing, and may of them still continued weaving, dyeing, and sewing once they return to their villages. Some have set up centers to support each other, some go to local markets to sell to the domestic market, and Houey Hong buys from them in support of making products for their retail and wholesale markets from Japan, US, Germany, the Netherlands. The center has become more known by foreign tourists interested in taking their workshops. With the help of good reviews on Trip Advisor, Lonely Planet, their retail shop in Vientiane, they see about 1000 visitors a year. They exhibit annually at handcrafts markets and shows, and have done well at those venues. 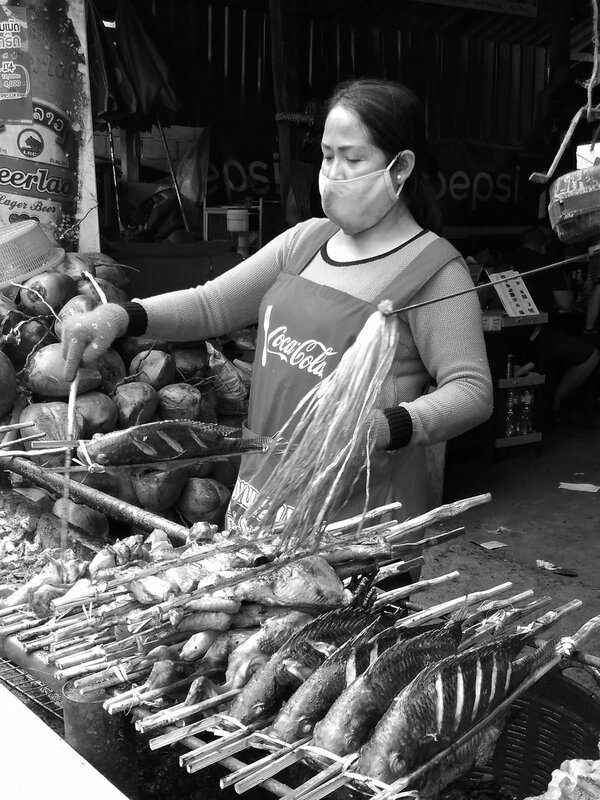 Sales are increasing, most of which come from local markets, as Lao women still wear the traditional skirt, or sinh. Sengmany also shared that while center has been successful, it’s a constant challenge to keep the center running and maintained. She pointed to the area where the natural dyeing takes place that badly needs repairing, mentioned their reduction in staff, and additional funds needed to train more women for their programs. My three days of learning at Houey Hong Vocational Training Center were eye-opening, awe-inspiring, and fun-filled. I’m grateful to Sengmany and her superstar staff for welcoming me and patiently teaching me how to make color, weave threads, and dye textiles. It offered me a glimpse into Laos life, bringing me closer to inspiring women and men, nature’s gifts, and cultural expression both traditional and present. And finally, we’re so pleased to introduce Indigo Lion’s expanded Lao Collection with the inclusion of several new textile accessories and home accents from Houey Hong Vocational Training Center! There was something mysterious about how those beads got into textiles made by Katu weavers. Returning to Laos earlier this year was a chance for me to find out. I first had to meet Keo. I came across several workshops being held at the Traditional Arts and Ethnology Center (TAEC) in Luang Prabang, including Katu backstrap weaving. That was it! I inquired more and soon found myself one morning in the company of Keo Jow. She led me to the side veranda, where we took off our shoes, and nestled down with a backstrap loom, threads, and beads. 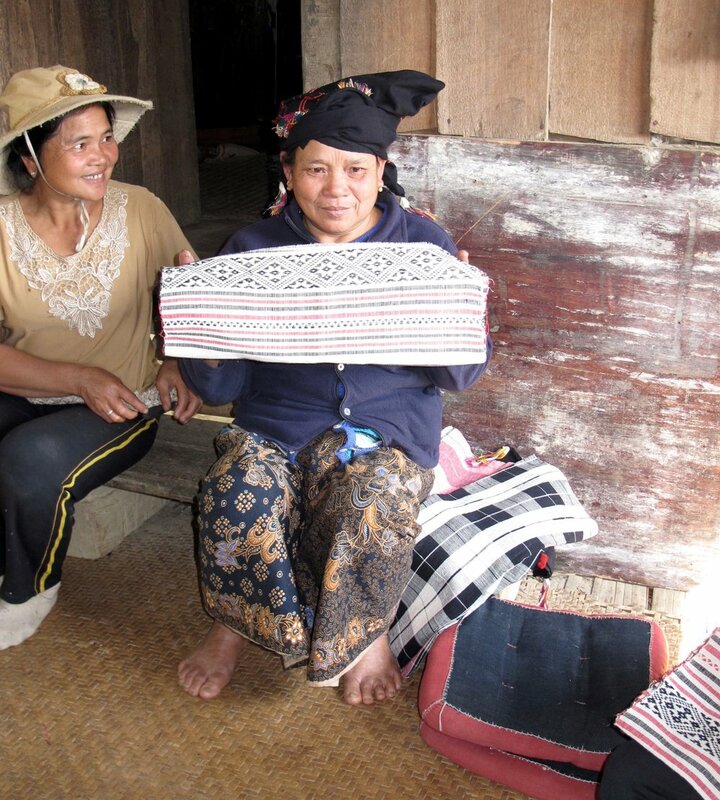 The traditional textiles of the Katu ethnic group in Laos are commonly identified with the intricate bead patterns produced on foot-braced backstrap looms. Women cultivate the cotton, hand spin it into thread, dye the thread, and then weave the textiles for use in clothing, ceremonial cloth, and trading. While the beads were traditionally glass and lead, these days imported plastic white beads are more readily available. Colorful pre-dyed cotton threads have also been introduced. The beaded motifs and patterns are reflective of their animist beliefs, as well as likely influenced by other Laos textile designs. I brush my fingers over pale beads. They are bumpier than I expect and offer a joyful contrast to the soft woven fabric underneath. These beads are clouds in a pink and purple sunset. They form the triangles that sit in the corners of eyes that have seen many smiles. They create a pattern that gives way to tumbling tassels. Always trying to break free. Always trying to instill order. I finally got my turn on the backstrap loom, too. Keo strapped me in and gave gentle and patient instructions to weaving, calling out next steps and long encouragements of "yeeees" when I finally started getting it. In contrast to Keo's deft and ease in weaving and incorporating those beads, I lost count and kept forgetting steps. I had previously learned weaving on a floor loom, but this was a different; a much more physical sensation. The tension needed in my feet and toes really mattered, always having to keep it taut but not too tight. I marveled at how thread could be arranged so simply and ingeniously around bamboo poles, carefully laced to create woven textiles. And that they didn't tangle. The first time she showed me how the beads got in there, I laughed with glee, honestly, as if momentarily being on the inside of some best kept secret. When I showed the video of Keo weaving in the beads at another Indigo Lion Pause event this summer, everyone had the same reaction as me, wowing and expressing relief with knowing! That was fun. I'm appreciative of Keo and the Traditional Arts & Ethnology Center for this opportunity — a glimpse into Katu handmade textiles, both traditional and contemporary. Interested in seeing Indigo Lion's collection of Katu Textile Table Runners? We're having a Summer Spectacular Sale of 10% off until the end of August with promo code SUMMER10! Katu Textile Table Runner — Pattern and detail lead the way on an unforgettable journey. 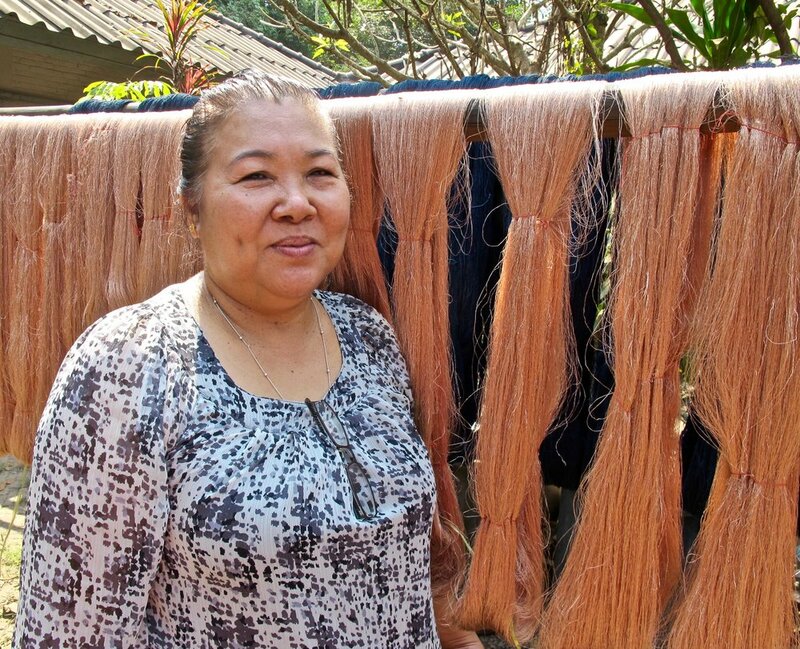 It was serendipity that led me to the weaving village of Ban Nayang Tai in Laos last year. I cherished my experience there and didn't think I'd ever be able to go back. But that didn’t end up being true. I did go back. Feasting on traditional Laos cuisine for lunch that was prepared by some of the village women. Mae Sam is seated left, a master dyer; then me enjoying every moment of it; then Emi Weir of the artisan enterprise Ma Té Sai; and Sengmany, who has become a natural leader among the weavers. I first met Emi Weir, founder of Ma Te Sai, an artisan enterprise in Luang Prabang, last year and sourced the Tai Lue home accents and Tai Lao accessories for Indigo Lion’s Laos Collection. She shared with me that the napkins I ordered were made by Sengmany and her young ten-year old daughter, Somaly, who was getting quite good at weaving. Upon my return to Laos in February, I reached out to Emi and requested to meet some of the weavers, particularly Sengmany and Somaly. I didn’t know then that they were indeed from in the same weaving village of Ban Nayang Tai. Savong's traditional wooden frame home is typical of the Tai Lue ethnic group. Women do their spinning and weaving underneath their homes, creating a wide range of hand-spun, hand-dyed, and handwoven indigenous cotton accessories and accents. We walked around the village and met En, who showed us spinning cotton into thread for weaving. Check out this brief video of shibori indigo dyeing with Mae Sam and go behind the scenes with her showing me how to create a particular shibori design using folding and binding between two bamboo sticks. After plunging several times in indigo vats, and several rounds of pounding, off to the stream we went to swoosh it around in the water. The final design and rich indigo color was quite lovely. We met many weavers, who all learned from an early age how to spin and weave. On the left is Silivong, making tassels on her indigo scarf; Savong in the middle in front her display of scarves; and Kon on the right, holding her copper-rose colored scarf. Click on the bold purple links above to purchase one of their scarves! I had the fortune of spending time with Emi on several occasions—learning more about her story as an Australian expat and businesswoman, seeing the difference she’s making in the lives of empowering women, and understanding more the current context of weaving traditions in Laos. She’s a vivacious, savvy, and determined woman and I really like this about her. 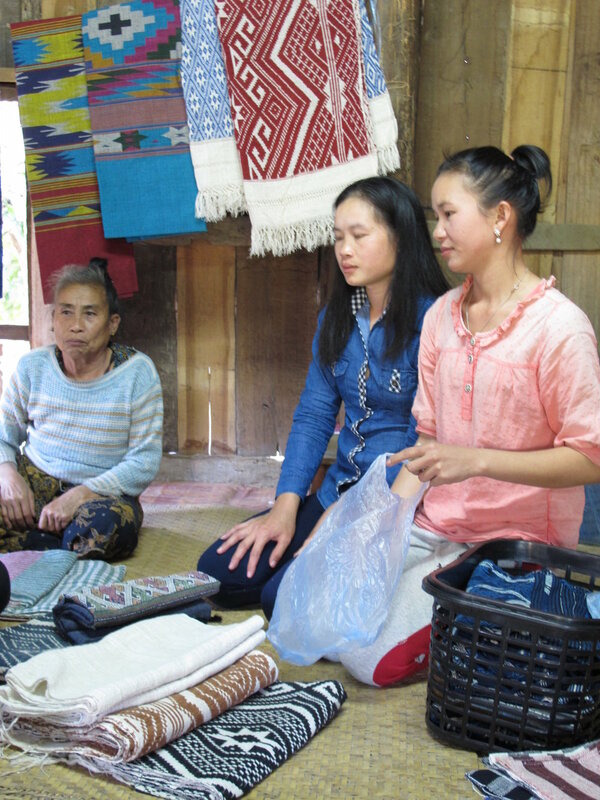 In the interview above, Emi shared how she got her start, her experience working collaboratively with Tai Lue village weavers, and her perspective on the changes, uncertainty, and opportunities for Lao traditional textiles in a globalized world. When I asked her what still keeps her here in Laos, she said it was the Lao women. I saw that so beautifully in Ban Nayang Tai. Fluent in Lao, her interactions with the women had a notable ease and playfulness. A mutual respect and friendship was palpable among them. And I met Sengmany and her daughter Somaly! 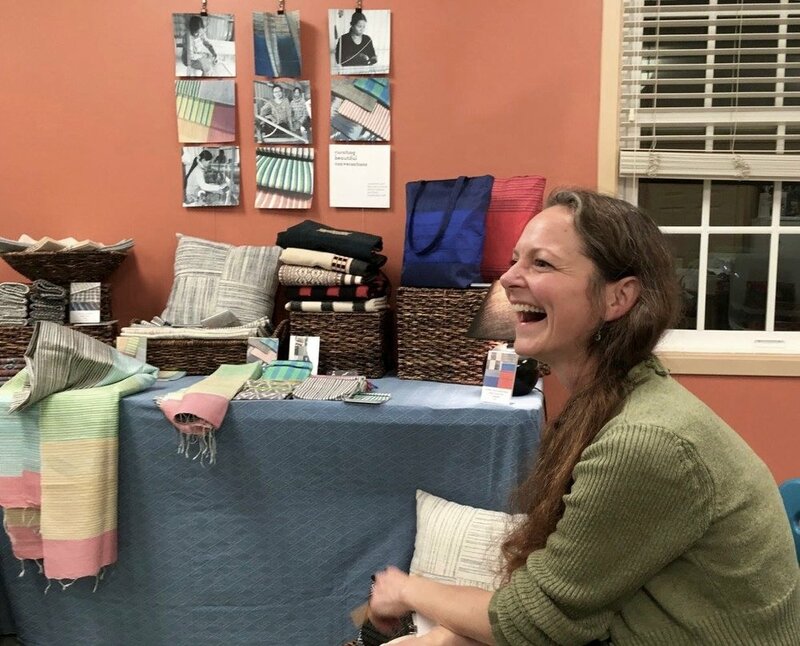 When I gave her the hangtag for the napkins, which had a photo of her designs and her at the loom (and a writing by one of the participants, Alexandra Boycheck, in the Indigo Lion Pause sessions inspired by her napkins), the expression on her face immediately lit up. While we couldn’t communicate in words, her facial expressions and intonations said everything. The simple recognition of highlighting her in this little printed piece from some faraway place let her know that she’s important, that what she does is valued, and that it means something to others halfway across the globe. 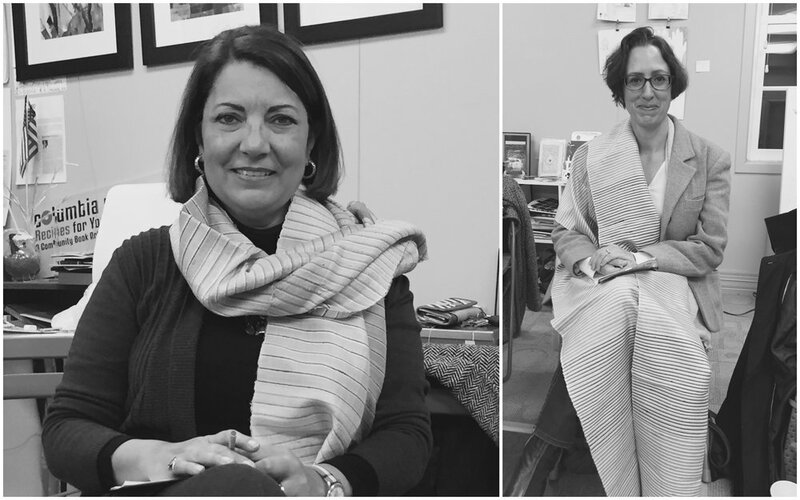 And in that recognition, if only for a moment, I felt that we—weavers, partners, me, and writers—were all connected around the one thing that brought us together: her handmade textiles. My overseas trip to Laos and Cambodia for three and a half weeks in February was essentially a business trip, but it was also a solo journey, one that I had to welcome along the way. Looking back on my many previous travels abroad — whether I was a tourist for a few weeks, a traveler for a few months, or an expat living abroad for a few years — they all seemed underlined by a seeking, adventuring, or escaping. But not so with this trip. My focus for Indigo Lion was to meet with current and new artisan producers and weavers; to scout for new handmade products; and to learn more about the handmade sector, the various weaving techniques and natural dye processes. And in between, when I wasn't engaged in business, I observed, reflected, and was open to the emerging creative ideas that were stirring. “Can I be alone? Perhaps this time I can take refuge in the aloneness. Remembering that melancholy girl of my early 20s, searching, searching elsewhere, always abroad. But this time it’s different. There is no searching. There is only trying to see more clearly, to be present fully. We discovered our inner prose and glimpsed into another part of the globe. We were moved by each other’s writings that evoked memory, that inspired story, that recalled people and place and unique insight. What happens when you hold handmade craft in your hands? What will it inspire you to write? This is what we discovered together in three Indigo Lion Pause sessions this fall. 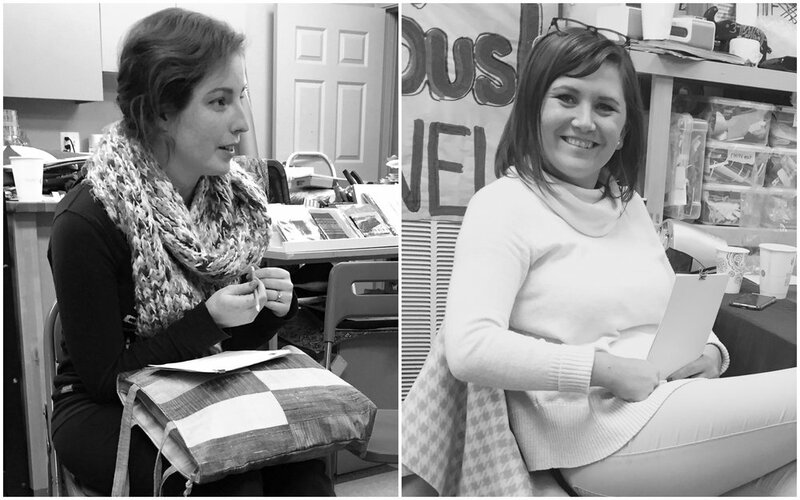 We paused together to hold handmade craft in our hands and write from the heart. We discovered our inner prose and glimpsed into another part of the globe. We were moved by each other’s writings that evoked memory, that inspired story, that recalled people and place and unique insight. We created beautiful conversations and it was magical. It started in my travels and living abroad over the years. I’ve long been fascinated by beautifully crafted objects and their stories. I would hold them in my hands, see them up close, let my imagination wander and wonder, and try to get a sense of the person who made it. Then a couple of years ago, I would get together with Sushmita Mazumdar, an artist, writer, and educator at her studio, Studio Pause for monthly “Mary Pauses”. These were wonderfully creative sessions. One of things I proposed was conversations with objects. I selected a few handcrafted items I had acquired in Mexico and Morocco and wrote freely what came to mind. I was surprised at what was revealed in my conversations. 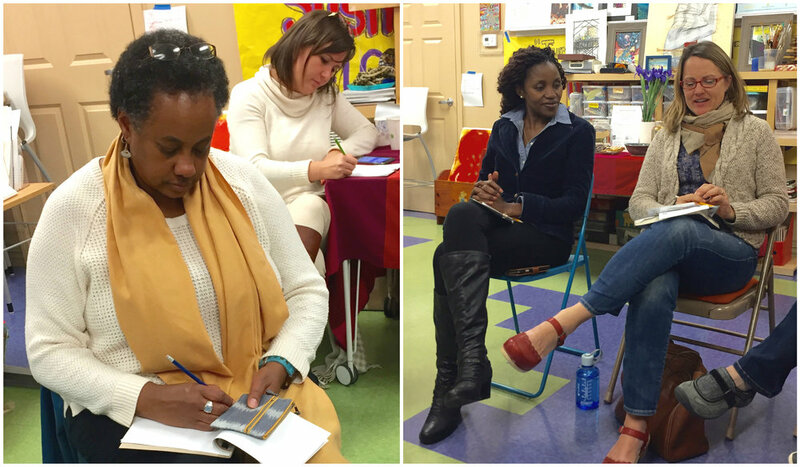 They were full of interesting associations, current emotions, and meaningful insights. Then this past summer I started attending Sush’s “writing pauses”, as she calls them, where we would use the monthly community art on her studio wall as prompts. In ten minutes we would write whatever came to mind — whether associations from past, or present thoughts, weaving in fiction, poetry, prose, whatever. With current issues being what they’ve been this year, we had conversations about race and religion, language and ethnicity, love and social justice. 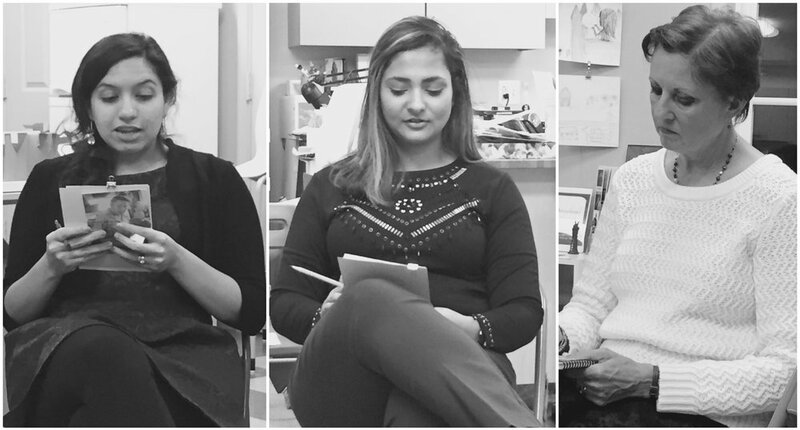 Kara, Sush, and Tannia inspired by Susan Sterner’s photographic posters of women day laborers in Guatemala at one of Studio Pause’s writing pauses. It was also around this time that Sush proposed the idea of doing a series of writing pauses with a twist: focusing on the handmade crafts I was bringing in from Laos, Myanmar, and Cambodia as prompts for writing. It all came together and Indigo Lion Pause was born. The instructions were simple. We could choose whatever handmade item on the display that spoke to us, bring it on our laps, feel it in our hands, and then in ten minutes write whatever thoughts came. There wasn’t any right or wrong way, or any particular way to do it. Just lean in and let our imagination be free to discover what might appear in writing. We were often surprised at what we wrote. But it was all from the heart, unfiltered, and on the spot. In that sense, it was magical. 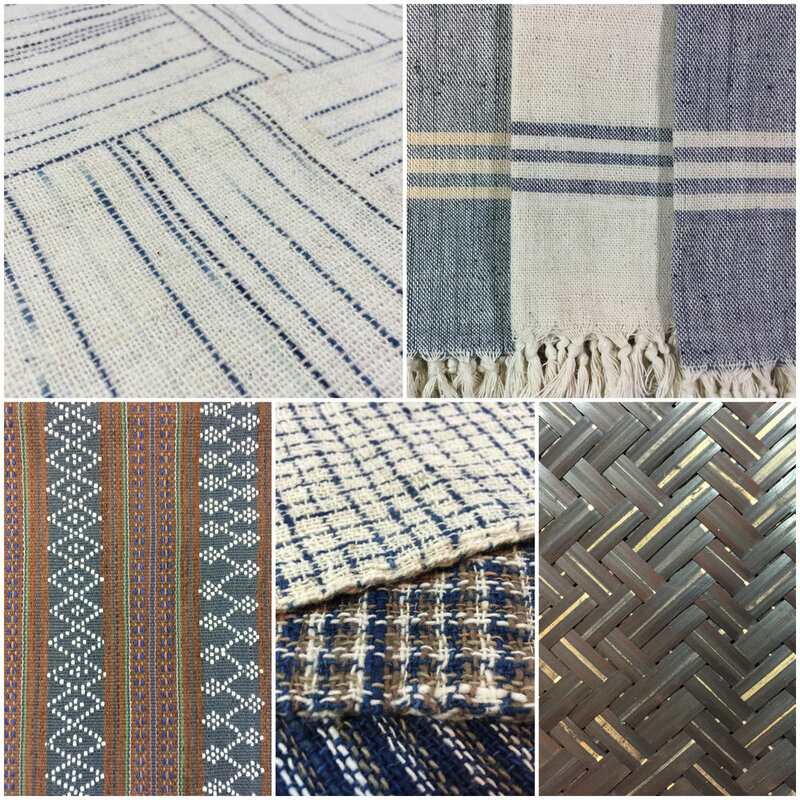 In October we touched the gentle indigo-dyed textiles from the Tai Leu, the ink-black woven bamboo from the Tai Lao, and the inlay woven beading from the Katu in Laos. Feelings of warmth and peace, memories of one’s grandmother and mother, of faraway cafes and imagined stories all came alive in our writing. In November we wrapped ourselves in uniquely designed blankets by the Tiddim Chin weavers of Myanmar. We got close to the intricate patterns, coiling tassels, and embroidered motifs. We traveled along railroads and went to villages at night, we felt textures and decided on designs, and told stories about reindeers and drums. In December we swooned over gorgeous rough-spun silk accessories made by Cambodian weavers and sewists. We let the colors take us to sky and fields, to subtle moods and wonder, to savor ice cream and remember home and childhood. And of course all of the items were available for purchase so participants could take home the ones they fell in love with. What’s next? The curating beautiful conversations booklet! Handmade craft has an energy and an unfolding story - from the artisan who made it, to liaisons working with those artisans, to me sharing it with others, and finally enthusiasts of handmade. We all contribute to the story of handmade. With that in mind, I’m compiling a booklet of the Indigo Lion Pause sessions to share our beautiful conversations with others. I’ve invited all the participants to contribute their writings with the intent to share it with the artisans and liaisons in Laos, Cambodia, and Myanmar. It’s a way to complete the circle and to show how we’re all connected, how what they do matters and how their handmade craft inspires us. Most importantly, I want to tell her how much I genuinely love what she’s made. I want to tell her that holding it in my hands is a delight, as if I can feel its energy knowing that she’s held it before me. I feel a glimpse of her culture by its colors and patterns and materials that are not my own, but allow me a moment of wonder about hers. I want to thank her for sharing it with me and tell her to keep making more because there are many others who would enjoy experiencing this too. This is my conversation, held in my hands, what I want to tell her. And in that moment we are connected, if only in my mind, around the one thing we do have in common, that we both held in our hands her beautiful handmade craft. A final reception will be held where we’ll showcase the finished booklet, share our collective experiences, and a chance to buy a copy! Stay tuned for upcoming details. A huge thank you to Sushmita Mazumdar for this awesome and fun collaboration, for opening your studio to us, and for conceiving of these wonderful writing pauses. Your constant enthusiasm, creativity, and tremendous support made the Indigo Lion Pauses spectacular. Thank you to all the participants (many of whom are dear friends and supporters) who paused from busy days and crazy lives to experience something new — writing about textiles from Southeast Asia, delving into memory and association and story, and sharing together a range of perspectives and emotions. I learned something from each of you and have tremendous appreciation for your writings. Finally, a big shout out to John Chapin, Alexandra Boycheck, Sharmila Karamchandani, and Brittany Noetzel for your enduring belief in me, good counsel along the way, and support beyond words. Thank you Alex Treble, Sushmita Mazumdar, and John Chapin for taking and sharing photos. It really was a lot of fun. What happens when you hold global handmade in your hands? What do you see, feel, or wonder about? As an artist I can't help but be curious about what's around me — what I see in nature, in textures, in other people's creativity and culture. Curating beautiful conversations is so much an extension of that, a space for connection and discovery around global artisans and their handmade craft. It's in that space as an artist that I wonder, see differently, and express creatively. Padee showing us her hand woven textiles with her husband, our guide and translator Sin, and me looking on (Thabou, Laos, January 2016). I begin by holding one of the traditional textiles I had acquired in Laos earlier this year from Padee, a weaver from the village of Thabou in northern Laos. isn't this not like life? What happens when you hold global handmade in your hands? What do you see, feel, or wonder about? What interaction, expression, or creativity begins to emerges for you? 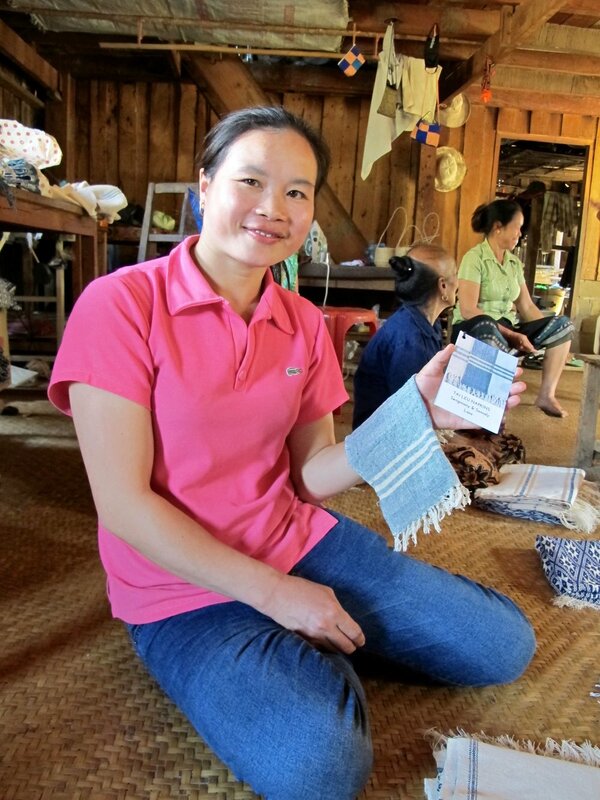 Read more about my time with Padee and other village weavers in my blog, "Letting serendipity lead to a weaving village in Laos." Hand-spun, natural hand-dyed, and handwoven indigenous cotton of supplemental weave from the Tai Lue ethnic group of northern Laos. Hand-spun, natural hand-dyed, and handwoven indigenous cotton from the Phu Tai ethnic group of Lahanam Village, Savannakhet, Laos. Hand-spun, natural hand-dyed, and handwoven indigenous cotton in traditional designs and patterns. 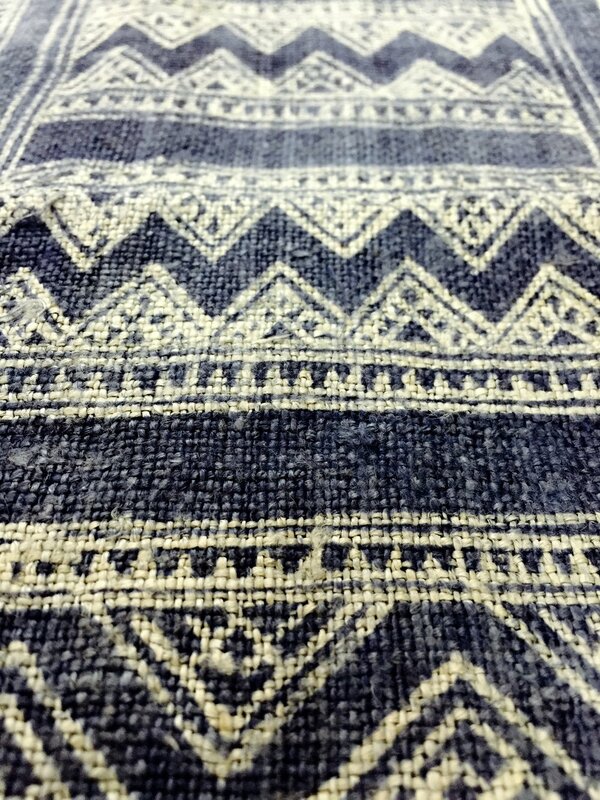 Handmade hemp indigo textile with drawn batik motifs from the Hmong ethnic group of Xieng Khoung, Laos. Vintage handmade hemp textile with drawn batik motifs and red appliqué detail from the Hmong ethnic group of Xieng Khoung, Laos. Hand-spun, hand-dyed, and handwoven indigenous cotton in a traditional design referencing a diamond-shaped seed. 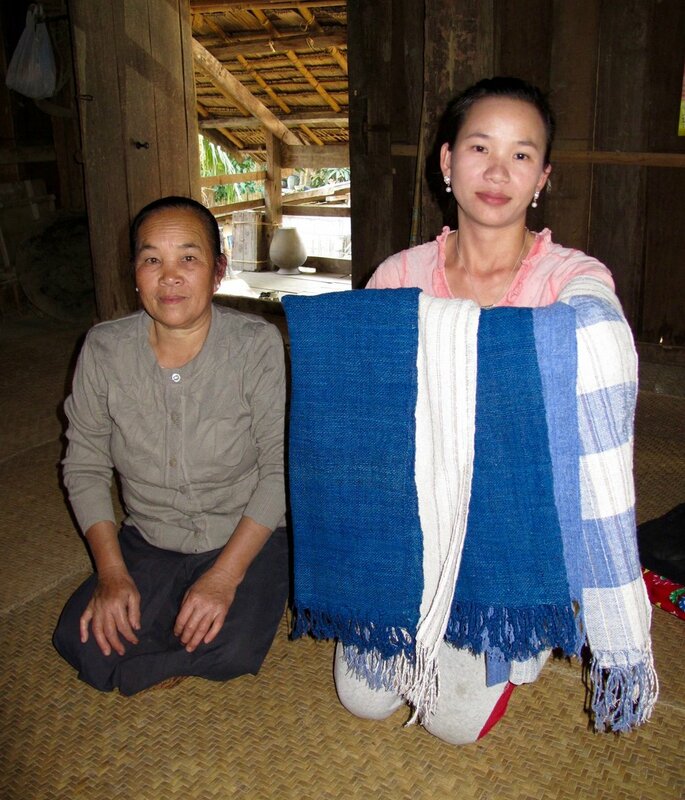 Hand-spun, natural hand-dyed, and handwoven indigenous cotton from the Tai Lue ethnic group of northern Laos. Hand-spun, natural indigo hand-dyed, and handwoven indigenous cotton in ikat patterns from the Phu Tai ethnic group of southern Laos. Hand-spun, natural hand-dyed, and handwoven indigenous cotton with hand-stitched pattern from the Lanten/Yao Mun ethnic group living in northern Laos. Hand-spun, hand-dyed indigo, and handwoven indigenous cotton thread made into big playful pompoms. 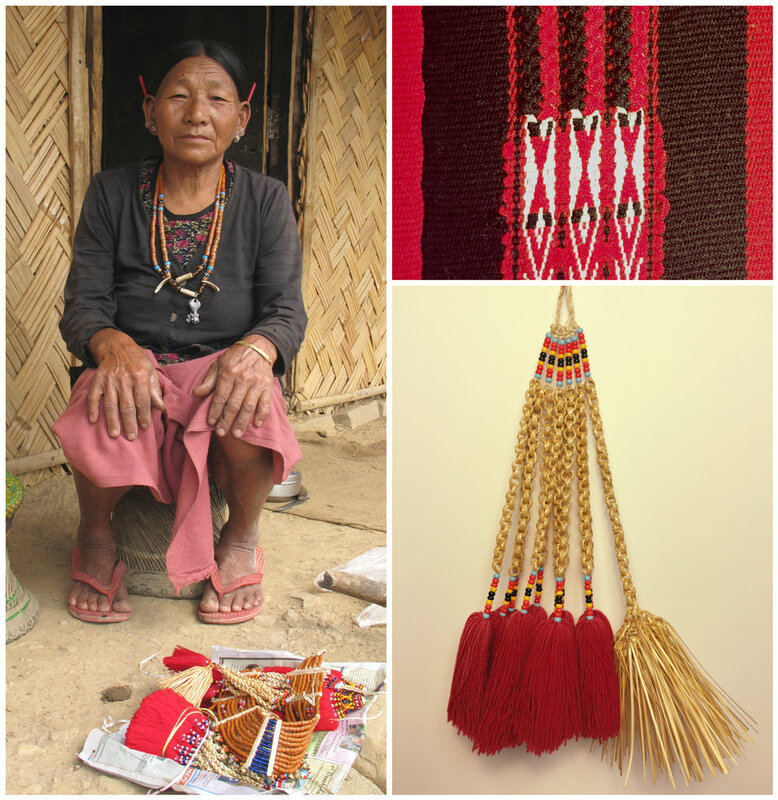 An elder woman of the Hong Phoi village in Nagaland, India, sharing her traditional crafted adornments typically worn for the annual Hornbill Festival. When I’ve traveled abroad and met artisans directly, even when no common language enables us to understand each other (or even when a willing translator doesn’t have much patience), a subtle kind of conversation begins to emerge. It’s a kind of conversation where gestures speak, expressions are felt, body language conveys and nuanced intonations are understood. There is little spoken between us, if any. What brings us together is a connection over one thing - her beautifully handmade craft. It’s in that moment that I know more intimately her talented gifts. And perhaps she knows something about me, that I genuinely love what she’s made and appreciate a glimpse into her world. I believe in this kind of beauty that delights the senses and inspires the heart. The beauty of the handmade object connects us with others, and them with us, through these subtle conversations and exchanges. Global handmade brings people, culture, place, and creativity together. Far Left and Right: cotton scarf and throw with Naga designs by Chin ethnic weavers from Myanmar; Second left: cotton shaman shawl from the Apatani tribe, Ziro Valley in Arunachal Pradesh, India; Second right: silk and lotus thread scarf from Paw Khone Village, Myanmar. We can positively influence the sustainability of the diverse global aesthetic and cultural heritage of our world. Our relationship with global artisans and their handmade craft matters a great deal. We do have a role in this; it affects change. As conscious consumers we seek transparency and expect fairness to artisans. As global citizens we advocate for equality and advance opportunity to artisans. As human beings we respect diversity and celebrate the creativity of artisans. A master weaver at Khang, a center for fine silks, textile design, Lao fashion and traditional weaving in Luang Prabang, Laos. This kind of beauty that delights the senses and inspires the heart is needed in our world. Without global artisans and their handmade craft, the world would be a much duller and narrower place, indeed. Let’s choose artisans and their beauty. Our relationship with global artisans and their handmade craft matters a great deal. We do have a role in this; it affects change. When we choose artisans and the beauty of handmade, we make a statement to the world. 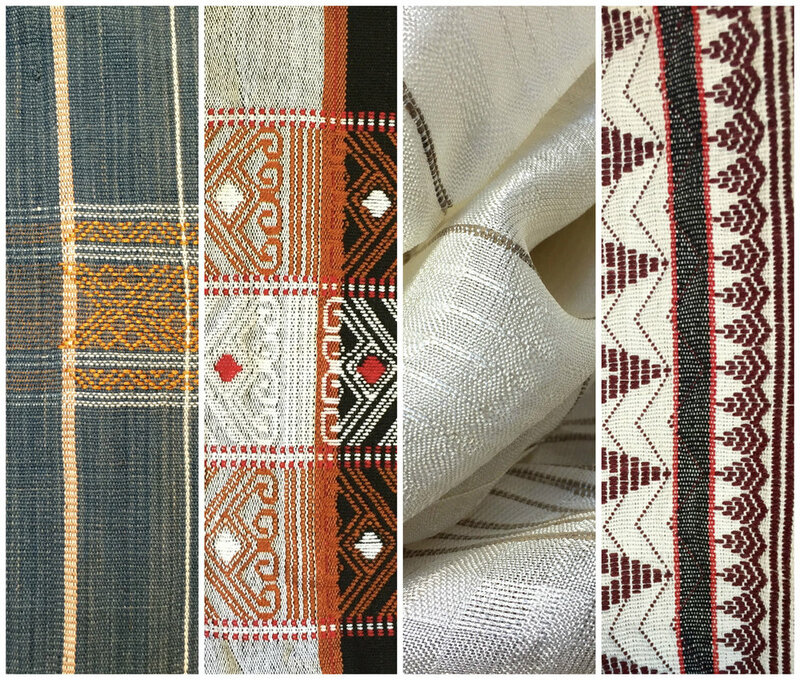 The sophisticated detail and symbolic motifs of handwoven silk textiles from the Tai Daeng and Tai Phouan ethnic groups in Laos, part of an initiative of Ock Pop Tok’s Village Weaver’s Project in Luang Prabang, Laos. They are the women and men around the globe who make, innovate and create handcrafted objects that are a delight for the eyes, rich to the touch, and accent uniquely in our homes and on our bodies. Their work is exceptionally fine crafted and designed, blending their cultural aesthetics with our modern lifestyles. Global artisans are the keepers of their cultural heritage, preserving ancient craft traditions, passing their knowledge and talent down through generations. But as the effects of colonization, war, displacement, and globalization have challenged their lives over the past centuries, so too have their livelihoods and cultures been threatened. Living in remote mountain villages in Northern Laos, the Lanten ethnic group make and wear distinctive black indigo-dyed cotton clothing. Here women are meticulously preparing the threads of a handloom for weaving. Movements by international organizations began to address the needs of artisans around the world, working with them as income-generating initiatives to revitalize their crafts and create market access. The social and economic movement we now refer to as fair trade had its beginnings nearly seven decades ago. Fair trade organizations positioned a more equitable international trading partnership for marginalized small scale producers, assuring them fair wages, better working conditions, equal access, and economic empowerment. US and European buyers, increasingly concerned with exploitive practices of artisans and farmers, helped raise awareness and advocate the benefits of fair trade to their customers. Today, there are thousands of organizations and social enterprises around the world that advance fair trade practices. 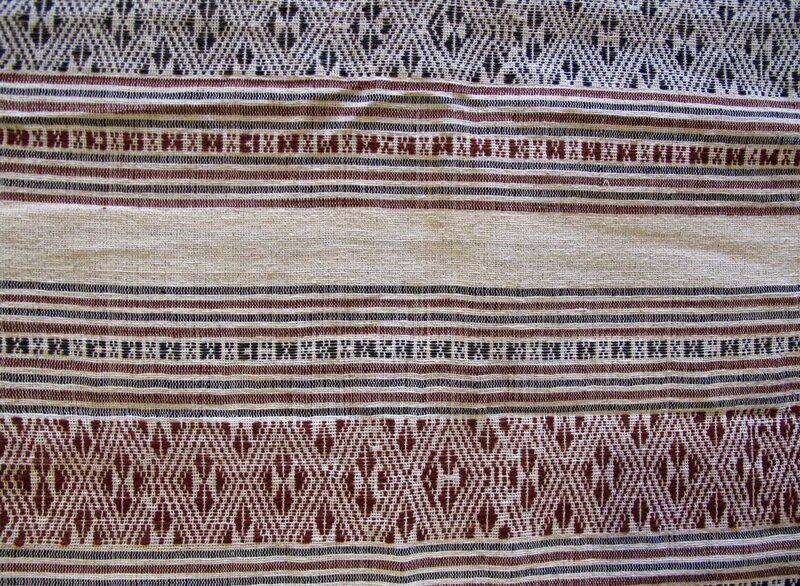 Hemp textile weave with applied batik designs of the Hmong ethnic group in Northern Laos, part of an initiative of Ock Pop Tok’s Village Weaver’s Project in Luang Prabang, Laos. The global artisan sector shows impressive numbers. According to Alliance for Artisan Enterprise Impact Report 2014, it’s the second largest employer in the developing world after agriculture; 65% of artisan activity takes place in developing economies; and it’s a $34 million dollar market. The social and economic impact to the artisans themselves when fair trade principles are practiced is impressive. There are countless real stories of artisans’ lives transformed when given the opportunity to earn an income for themselves and provide for their families. When given access, training, and resources, they can thrive and inspire others, often becoming agents of change in their own communities. This is the power of women's empowerment in action. When we choose fair trade handmade, we are choosing to impact local economies in very real and direct ways. When we choose fair trade handmade, we empower positive change for global artisans. And ourselves. I felt genuine excitement from seeing beautifully made textiles and meeting the women who were creating them, trying my hardest not to go crazy just admiring it all. It was the kind of day that I had dreamed about for many years — connecting with artisans abroad directly in a tangible way. Seeing each other face to face, glimpsing each other’s lives and livelihoods, and having a shared openness that engages us around beautifully handcrafted objects was always at the heart of it. I met Sin at Ock Pop Tok, a well-established boutique shop in Luang Prabang, Laos, a social enterprise working in both ethnic and contemporary textile designs. When I first walked in the store, his approachable smile and inviting manner made our conversation easy. Sonnalee, the store manager, and Moonoy, the assistant manager, were equally engaging. It was clear that they all cared about their work, were extremely knowledgeable about the various ethnic groups throughout Laos making the textiles and textile products, and passionate about the social mission of Ock Pop Tok. When I introduced myself and the idea of Indigo Lion Artisan Boutique, Sin invited me to his village to meet women who still weave traditional designs and have finished products, if I was interested to buy. Of course I said yes! Two days later we met early morning at the bus station for the two hour trip in the back of a crowded, bumpy, open-sided, two-bench vehicle. Sin had also invited two of his expat colleagues at Ock Pop Tok – Marie from Greenland, their Production Coordinator, and Katie from DC (small world! ), who had just started a couple of months prior as their Marketing Coordinator. Her husband Daniel had joined us, as did my husband John. When we arrived in the remote village of Ban Thabou where Sin grew up, the first order of business was lunch. We walked a little ways where his family grows rice and vegetables, and picked up handfuls of fresh greens. Kitchens are generally outside the homes we’d noticed (much like outdoor camping but more permanent here), so that’s where we headed in Sins’s home. It quickly became a group event. Marie washed the vegetables, Katie chopped them, Sin’s mother Lasoy went off to buy fresh fish, his sister chopped wood kindling, Sin and his niece got the fire started, Sin’s brother cleaned and skinned the fish, his mother grilled it, and Sin boiled the green vegetables in lemongrass and garlic. And me, well, I was the official photographer. The sense of gratitude to Sin and his family, his mom especially for welcoming us into their home was palpable. Not often do travelers like ourselves get a chance to make the kind of serendipitous connection, where without planning and much fuss do we get a glimpse into the lives of others very much in their homes. Lunch was fantastic, to say the least, and we returned a small gift in kind of fruits and vegetables from the market we picked up later in the day. Bellies and hearts full, we moved to the next order of business, which was all about textiles. From her wardrobe Sin’s mother began to pull out several plastic bags of her family’s collection of hand embroidered textiles and traditional clothing. She didn’t have a lot, most were family heirlooms, and they were all extraordinary. The traditional headscarves caught my attention most – deep blue-black indigo with a refined yet simply detailed embroidery that I had never seen before. It had been handspun, hand dyed, handwoven, and hand embroidered by Sin’s mother many years ago. She placed the headscarf on her head in the fashion of the Tai Dam ethnic group of which Sin and his family belong (and most of the other villagers). Something in her came alive, as we ooh-ed and ah-ed in delight. She rummaged back in the wardrobe and pulled out a traditional jacket and skirt and put it on, looking at herself in the cracked and dusty full-length mirror that didn’t matter; she looked beautiful. She and Sin both said they couldn’t remember the last time they took a look at these traditional clothes and textiles, but it had been a long time. I wondered what memories came to her in that moment? What was she feeling then of the past, the present, of herself? She seemed pleased, then slightly embarrassed, but she knew we were all appreciative, a special recognition in that moment. 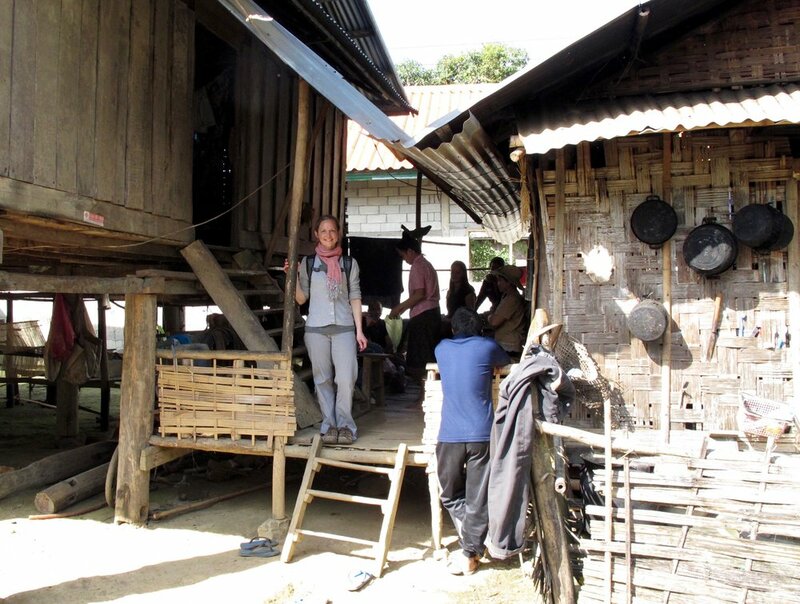 Next we walked down the road to a cluster of traditional wooden homes built on stilts to Lasoy’s sister’s house. Pavan and her husband welcomed us warmly and showed us her collection of cotton textiles she had also handspun, hand dyed, and hand woven. She had products ready to sell. Inquiring more about the textiles, the cotton was grown from nearby farms, as was the raw silk (we visited the silkworms in various stages of production at another woman’s house). The designs were traditional, referencing the diamond-shaped mahoy seed. The dyes are natural, produced in the village from the indigo plant and macbau, a small fruit plant used for the red. A little negotiating and I bought two pieces that I could envision as table runners. Pavan seemed most grateful for the sale, eyes watery and her palms pressed together, thumbs touching her forehead, saying khob chai to us, “thank you.” We learned after that her health was not good and the money would help her get treatment. Padee was waiting for us at the house next door, with an even bigger collection of finished textiles, all beautifully crafted. I had to keep in mind that I was buying for my shop, and that a random assortment of this and that design wouldn’t work, so I leaned in on similar designs of what I just bought. Padee had a gorgeous piece, something Sin said could be a wall hanging in my shop to showcase the Lao Tai Dan style. Great idea, I thought! So I bought it. What I was feeling at this point was mostly amazement that this was actually my life ,that after so many years of wishing for and wondering how I was to segue into the global artisan field, it was finally real and tangible. I also felt genuine excitement from seeing beautifully made textiles and meeting the women who were creating them, trying my hardest not to go crazy just admiring it all. Finally, I had to keep my mind on my business when it came to buying, the reason why all of us were there, truthfully. For example: Would it sell. Does it convey a story. Will this evolve into a longer-term buying relationship. What is my budget for today. Are these good prices. Does it fit in my luggage. Can I ship it home. I couldn’t buy a lot, nor did I buy from everyone, being mindful not to buy out of pressure or obligation, which was insanely hard. 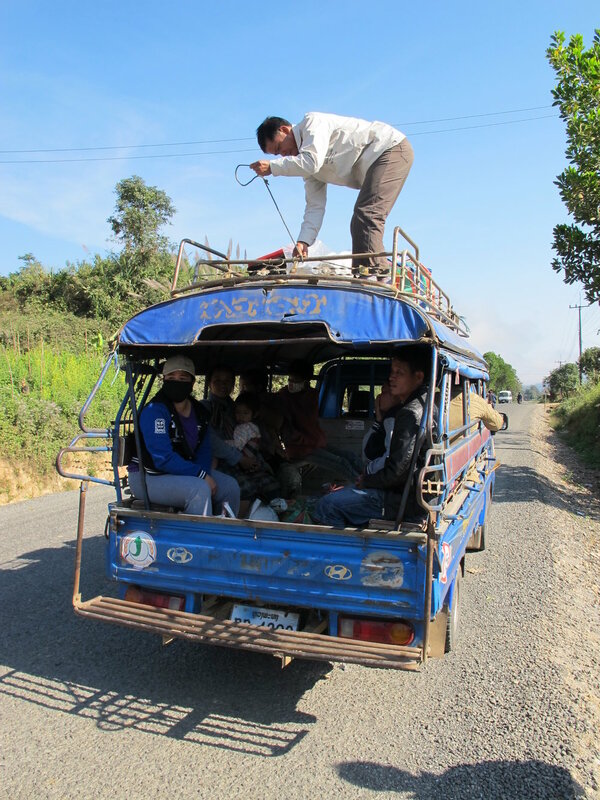 Sin’s friend with a van then drove us 20 minutes to the next weaving village of Nayang Tai, of the Tai Lue ethnic group. One of the traditional homes had a large open room where they received us. One woman, than another, and another started to arrive, then more, eager to show us what they made, and to sell. I guess they got the word out that we had arrived. Bags upturned and textiles unfurled and displayed on the floor in front of us to see, all so wonderful I didn’t know where to begin. Most of what they showcased were cotton scarves, runners, and napkins in their Tai Leu style. While the style was only slightly different to the Tai Dam, their resources and processes were similar. Cotton grown from their farm, hand spun and woven, using natural dyes – the indigo plant for the indigo blue, the macbau fruit for the red. 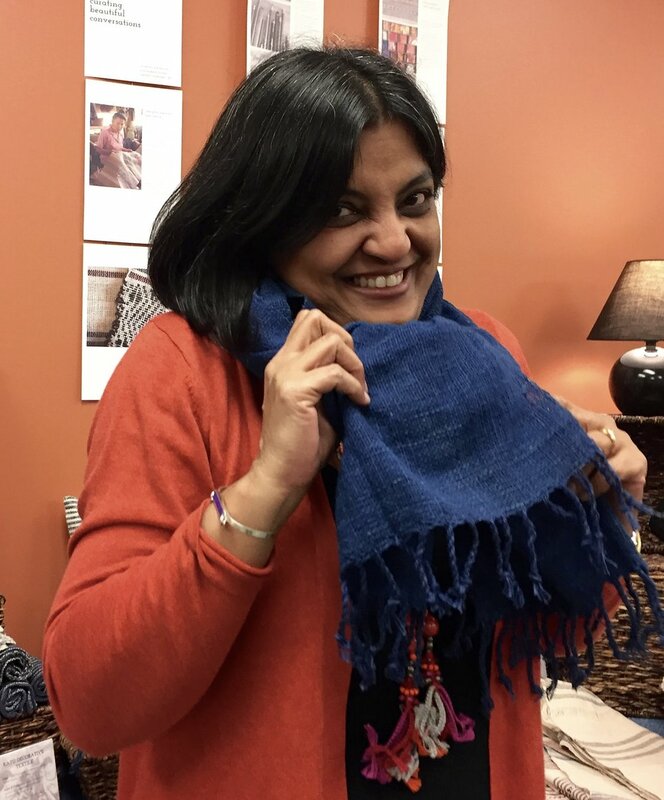 I bought five scarves of varying patterns from Chaban and her daughter, Noy and ten napkins from another woman, Panya, completing my collection. As usual, I wondered more about the women I was meeting. Conversations translated through Sin were simple introductions that at least mattered to me. I wanted to know their names, a little about their textile designs, how long they’d been weaving, who taught them, what their products were made for. Most followed traditional designs and processes, all learned from their mothers who learned from their mothers, and many of the textiles they made were for their own home and for themselves. For Sin, I can only imagine his motivation for bringing us to his village and that of a neighboring weaving village. It is clear he is proud of his ethnic heritage, and perhaps sees bringing people like me and other buyers in direct contact with the artisan producers as an economic advantage for everyone. He’s a young kid, maybe 20, still in school, but already entrepreneurial. His honesty, generosity, and big heart won me over early. He shared that he hopes in the future he can do more of this kind of work, bring artisan producers to buyers and markets. With a nod towards encouraging him in his idea, and an expression of my gratitude for his generosity, I gave him a commission. I’ve already promised myself that I will return to Laos, to Luang Prabang and other regions of this ethnically diverse and culturally rich country. 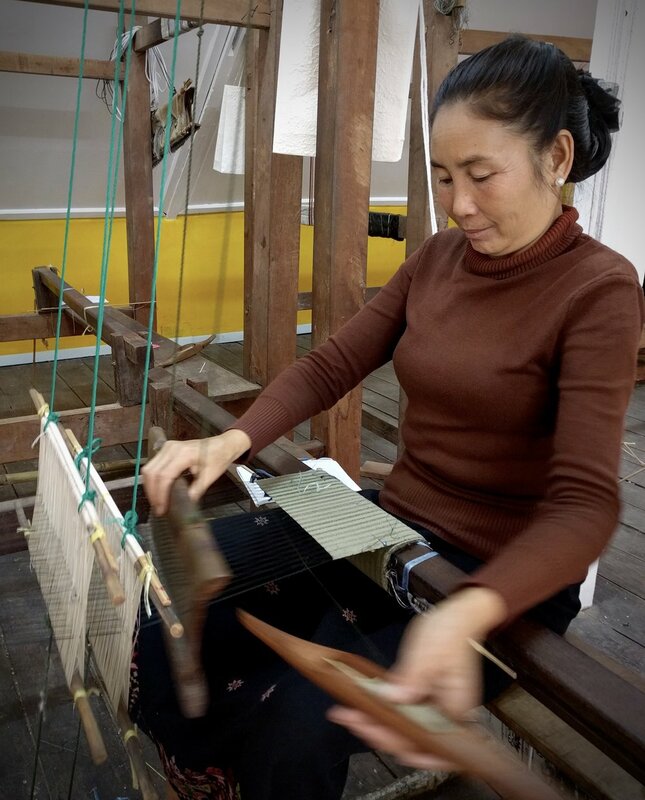 In just two weeks in Laos I have learned much, but barely enough, to understand the full scope of traditional textiles and their place economically and culturally within Laos and wider markets, for which I am now an invested contributor. And understanding the value of time — time to get to know people, to build trust, to show sincerity — allows serendipity to happen. A tiny glimpse into her world, and her into mine, and our exchange across her handmade paper etched in my memory. In these past two weeks, still at the beginning of a three-month journey across Southeast Asia and Northeast India, I’ve discovered that the kinds of conversations I’m having must be redefined. It seems many of the conversations are with so few words, of each other’s language neither understands, picking up on intonations and simple gestures. What brings us together is a connection over one thing – beautifully handcrafted work. As an artist and in my travels abroad over the decades, I’ve long been fascinated by beautifully crafted objects and their stories. The conversations we have with the people who create them to better appreciate their culture and understand their livelihood. Or the conversations to discover the meaning of the motifs or the techniques of their designs. What would the conversations be if we would convey our appreciation connected with our own story to the artisans when we encounter their creations? As I embark on a long-held entrepreneurial dream of opening a global artisan boutique later this fall, part of this overseas trip is connecting with artisans, having conversations, and sourcing products. Indigo Lion Artisan Boutique will be a place to discover unique and meaningful global handmade gifts for home and lifestyle, with a vision of curating beautiful conversations. Of the handful of conversations I’ve had with artisans so far, one in particular stands out –an old Lanten woman in Luang Namtha, Laos. 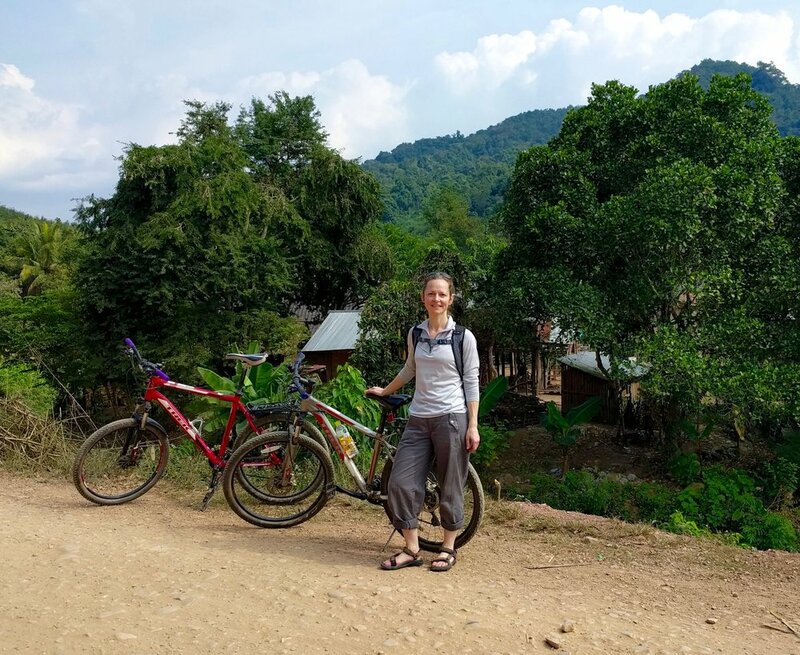 My husband and I rented mountain bikes and set a course for the the Nam Dee Waterfall, about 2 miles from the center of town, where we’d pass a pair of Tai Dam and Lanten ethnic villages. While confessing to know little about either, some prior reading about the Lanten at the Luang Namtha Tourist Information Center peaked my interest. 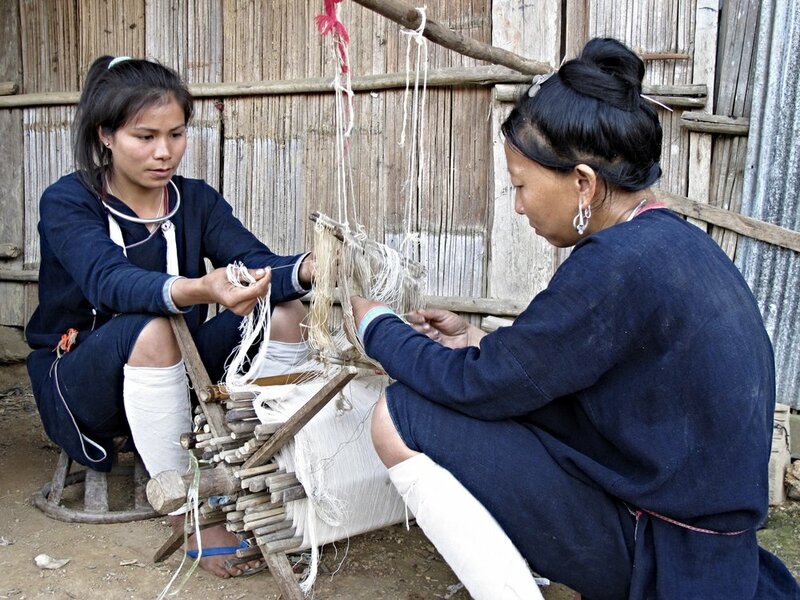 Like many of the 15 or so ethnic groups in Laos, the Lanten still live their traditional ways, follow ancient beliefs, and make much of what they need using natural resources from their immediate environment, including handcrafted objects mostly made by women for daily use. 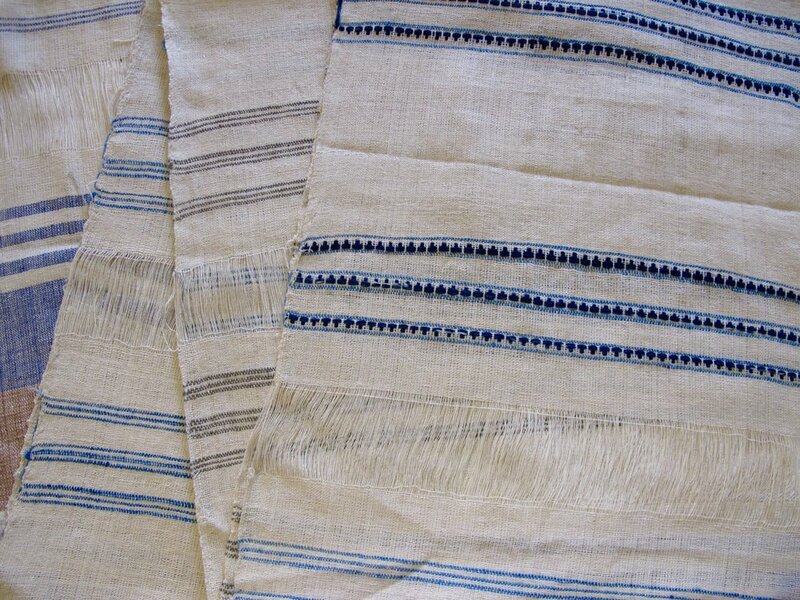 One of the things Lanten women make is bamboo paper, some of which is dyed with indigo. It was completely serendipitous that we came into contact with her. At the end of the dirt road on the village’s edge there she was, making paper along the banks of a stream near the Nam Dee Waterfall. My conversation with the old Lanten woman began with me gesturing if I might watch her. Not stopping her work and barely acknowledging me, she signaled with her wise eyes that it was alright. I felt privileged to get close, to crouch down, to just watch the gentle movement of her hand pouring a gooey mix onto the indigo dyed paper. I wondered what stories she held, what kind of life she’s had, who she was… I merely had to be content, as this beautiful conversation was showing me, to just be with her. She warmed up a bit, hand gestures and foreign words between us. I can infer as best I can when clarity is not there, but when she put a big folded piece of handmade bamboo paper in my hand, then signaled down to her feet with her face showing a sign of pain, this I understood: please buy this paper from me. Her wrinkled wizened fingers held up two fingers (about $2.25) and I kept that paper close to my heart, feeling all of her energy from her to me. She pointed to my camera, then to her, and I took her picture for her to see. She smiled wide, and I was on my way again, deeply grateful for the serendipitous moment. A tiny glimpse into her world, and her into mine, and our exchange across her handmade paper etched in my memory. It was a beautiful conversation. I look forward to curating this beautiful conversation and many others like this, to enable others to discover the unique and meaningful stories behind the handmade gifts they purchase.